Today I am not going to write about death. I want to write about miracles. I cannot remember all the details Lijun Deng told me on May 12, but from her words, I learned that she is a partially disabled student. Since childhood, her left leg has been stiff and cannot move freely. At that moment [on May 12], she was permitted to go to the bathroom downstairs 10 minutes before the period ended. She moved slowly, getting to the ground floor, and out of the building. When she was in the sunlight outside, the earth began to roar and everything began to shake. She tried all she could to run away from the building, and fell several times because of her clumsy left leg. But she made it to a small bamboo forest nearby, and then she heard the physical education teacher shouting, “Go to the open square!” So she made it there with another three girls. Three minutes later, all of the 483 students were gathered. I thought to myself, she was really lucky to get out of the classroom early. With her dead leg, she could have been knocked down by the rushing crowd and hurt. Then it would not have been a miracle. 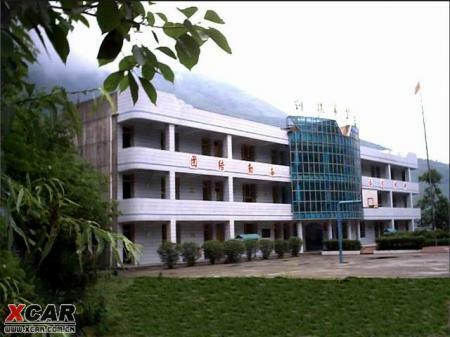 A miracle that none of the 483 students was even injured, when other school buildings, such as Beichuan No. 1 High school, collapsed and suffered over two thousand student deaths. Then the miracle journey began, led by Xiaochuan Xiao, one of the teachers. He and another eight teachers lead 71 students (other 412 were all back with their families after the quake) through a two day and one night ordeal, without water or food, over the mountains, to reach Mianyang City unhurt. One of the kids was just four years old, and one of the mountains was over 2000 meters high. 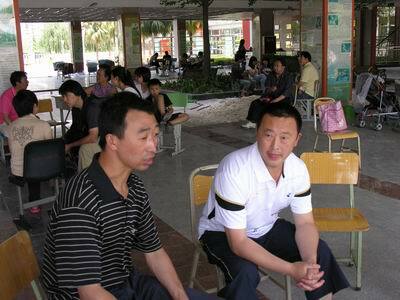 It has become a legend throughout Mianyang city and the Beichuan district, how the 71 students survived. But I don’t want to tell the legend that is being spread around. I want to tell you the true story I learned. The true human story. Not heroic, but human. Xiaochuan was interviewed on Sichuan TV and China Central TV (CCTV), and he was asked about a lot of the details. But he told me afterwards, “I did not say this to them, but I will tell you: I was so scared. I did not truly believe we could survive. It was the end of the world.” Wu, the other teacher, said: “It was so terrifying I thought it was my last day alive. Our last day.” That did not sound as heroic as in their TV interview. But I think it was much more human and convincing. They saved the kids. Remaining in that open square was not safe either: The mountain was roaring and huge rocks were rolling down the hill nearby. They had to move to a higher and safer place. After carefully looking around, the teacher decided to move to a flatter mountain slope. They moved the whole group there. Xiao had never learned how to chop bamboo, but on that day, he cut through a lot of bamboo to get through. Wu picked some rags he collected along the way through the village and they made a simple tent with what they could find. It was too small to have everyone lie down. The students slept under it sitting back to back. When it was all dark and the earth started to shake again, all were deadly scared and no one made a sound. It was raining, and they were shivering. They felt big rocks rolling down the hill, making a terrifying noise. They were the scared lambs, and the teachers were the shepherds. They spent the night in a corridor in another school that felt solid. It helped the young children to feel safer and protected. When they left there, they were better organized, less panicked. It makes my heart ache to think how they went through this, being so young. “There was no light at all, just terrifying darkness.” But later some kids started chatting and telling fun stories. Deng was smiling when she told me about this. She told me how they run, who fell down the stairs, joking who was scared and called out “Mom!” She told me she likes her own name*. I did not get why they tried to go through the mountains and all the difficulties to get to the city. Why didn’t they just stay there and wait? “We understand county leaders. They were busy rescuing everyone else in town, and had no time for us at the moment. We had to rescue ourselves.” There was no argument; the decision was clear to them. Go and seek help, don’t wait. It was a gamble. 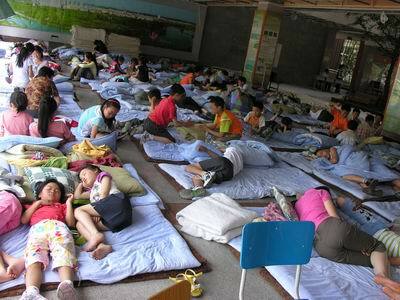 Go through the shaking mountains with all the young children – staying put may be more dangerous. Their path: Shuidong, Jingjiashan, Yangliuping. Three mountains and one huge forest. They went through crevices, around landslides, through heavy rain fall. One teacher, a woman, went off on her own for understandable reasons. Another woman teacher had asthma and along the way she looked blue. She said, “I will follow along. I will not die here.” They pushed on. So they were making a lot of noise in the forest, till they got out of that terrifying black fog. The girl in red, now asleep, both of her parents died in the quake. She has been silent these days, and closed her arms together during her sleep. The way from there was more difficult. There is a saying: Don’t marry your daughter to a Jingjiashan man, you will not see her again easily. And another saying goes: You can not get through the path without climbing shoes. It was a very difficult mountain path, slippery and surrounded by steep cliffs. The mountain was full of cracks caused by the quake, and there were landslides. Even worse, the path was almost unrecognizable by now: The earthquake had changed the mountain’s orientation. The path that should go up now goes down. The path that should go left now goes up, and by turning left one will fall off the cliff. But they guessed the way through. And they found their path. “It was muddy, and many of us lost their shoes.” But no one was left behind. The older kids helped the younger ones (the youngest was less then five years old), and teachers helped them to find shoes, even stealing shoes from the villagers. Two days and one night. Seventy-one students and eight teachers, with a couple bottles of water and two packages of crackers. “We teachers let every student get a small crumb of crackers, and a tiny bit of water,” Xiao told me. “Just enough to keep up their spirit to survive. When someone was swallowing up front, you could hear the mouth of someone behind water and they swallowed that. My eyes filled with tears when I heard that.” Xiao said. Sadly, on their way, they passed two places which should have been able to take them in, but they were turned away. For many reasons, I did not get the names of these two places. Finally they arrived in town. There was no ice cream or candies. Everyone was too busy. After two days and one night, the children led by their teachers finally saw a highway toll booth, where the rescue operation headquarters was based. The county governer Jin asked, “How many from the school are still alive?” “Everyone is here.” It was a big surprise to the governor. “I thought all of you were gone,” he said. On the bus to Mianyang, all the kids fell fast asleep – they were dead tired. But, when the bus arrived in Mianyang, all were in high spirits. They were kids from the mountain villages, most of whom had never seen such a big city. It was heaven, even when it was in chaos after the earthquake. For children who had just come through hell, this must be heaven. I did not want them to talk too much about the scary details. Kids should be cheerful. I have not yet told you the most miraculous part of the story. If the teaching building of the school had collapsed within seconds of the earthquake, like what happened in many nearby schools, the miracle of trekking out of the mountains wouldn’t have taken place. Not a single student died on that day. None of them was seriously injured. 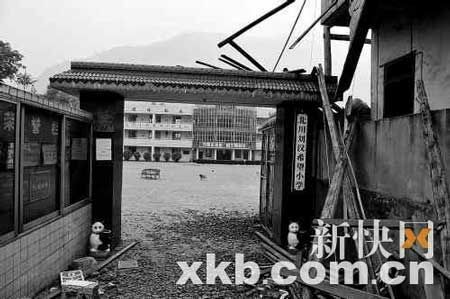 The teaching building, which is formally called Liu Han Hope Elementary, did not collapse. It was amazing that not a single part of its three-story-high glass wall was broken. That was definitely abnormal when we saw hundreds of classroom buildings tumbling down and take thousands of lives in the earthquake. I was curious to know who had constructed the building. “You have to make sure the building is good quality, otherwise you will be the first to be fired,” Mr. X’s bosses said to him ten years ago before the building was constructed. Mr. X once found that the cement used in constructing the school had too much mud mixed in it. He ordered that all mud be washed away, because as a cement expert, he knew it could cause problems. He also ordered all flat pebble stones to be replaced by round ones, because he was afraid that they might weaken the structure. There was a time when the project was delayed and Mr. X found out the reason was because some local government officials had intercepted the donated money. According to China’s donation regulations, a party who wishes to donate an elementary school has to give its donation to a government department, which then transfers the money to a contractor to implement the project. However, very often officials put the money into their own pockets. Mr. X was very angry when he found out about it. He pinned down the officials and managed to get the money available for the project. At the cornerstone laying ceremony, Mr. X got furious again when he learned that the project would be delayed again for certain reasons. He argued with local officials and got a playing field constructed for the school. He was very glad with the brand new field. Ten years later it was the place where 483 children survived the earthquake. During that period it seemed that Mr. X was arguing with people all the time and easily lost his temper. When I asked him about it, he urged me not to write too much about it. He said he didn’t want to cause unnecessary trouble. A person who knows well about corruption in administrating donations commented: it was a miracle that all students at the school survived the earthquake, but it was another miracle that Mr. X managed to get his company’s donation to end up in the right place. Why did so many schools collapse during the earthquake? Please forgive me for not being able to say the reason directly here. But I think most people already know the answer. It was miraculous that not a single person at the school died in the earthquake. But it was a true miracle that somebody fought hard for the school’s safety ten years ago, so it was able to stand firm in an earthquake many years later. * Lijun Deng is also the name of a famous Hong Kong pop singer.